You read my previous posts about the healing power of soup. I shared a recipe for making your own soup stock, and now it’s time to cook some soups, and share the recipes with you. Some people enjoy eating soup so much, that they even eat it as a late breakfast meal. Many Europeans eat soup daily, and sometimes soup and sandwich is a perfect way to end a day, and call it a complete dinner. Today I cooked Corn Potato Chowder, and I kicked it up a notch with some ground red pepper, to appease my husband’s taste for spicier tasting soups. Use a 6 quarts stockpot. Pour 2 Tbs of canola oil into the stockpot, and heat it up over medium heat. Add chopped onion, and celery. Saute until onions begin to turn golden. Add chopped garlic, and saute 1 minute longer. Partially cover the pot, bring to boil, then reduce the heat to low. Simmer for about 15 minutes, or until potatoes are soft. Use a potato masher, and pulse the potatoes (in the pot), about 5 times, to break them up a bit. Add corn, and simmer for 8 minutes longer. Using a slotted spoon, remove about 1 cup of the corn/potato mixture, place it in a food processor, or blender, and pulverize it (optional). Return it back to the pot (this makes the soup a bit creamier). Stir in milk, and heat for 2 minutes. 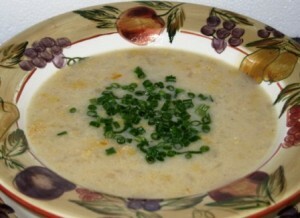 Place the sour cream in a small bowl, temper it with some of the hot soup mixture, then mix it into the soup. Season the soup with salt, black pepper, and red pepper (if using). Serve hot, garnished with 1 tsp. of chopped chives.